Successfully Added FM Transmitter Cradle for IPHONE + IPOD to your Shopping Cart. 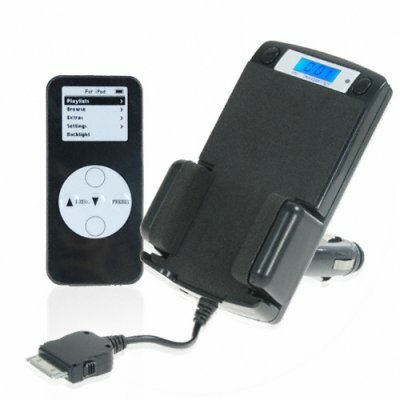 FM transmitter and cradle for listening to your IPOD and IPHONE music while on the road. This is an easy to use product with a simple function, to allow you to listen to the music on your ILife product (IPOD products and IPHONE) through your cars stereo. Simply set the FM transmitter and car stereo to the desired matching frequency, and you will instantly start enjoying your MP3's through the cars stereo system. The FM transmitter cradle additionally charges your IPHONE or IPOD family product while it is plugged in. Also included in the kit is a credit card style remote control. This is a perfect item for not only safety on the road, but for having a good time at the same time. A wonderful little product that is offered to you at a low wholesale cost and with no minimum order quantity (M.O.Q.). From the leader in direct from China electronic products, Chinavasion. FM Transmitter for IPOD products + IPHONE - listen to your MP3's on your car stereo. Simple plug and play product - easy to use and easy on your pocketbook. Can also be used as a car charger for your IPOD or IPHONE.